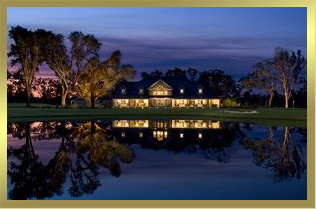 Suitably situated in these pristine Southern surroundings, overlooking the lake and eighteenth hole, is the 8,500-square-foot clubhouse, designed in the classic low country style. Vaulted ceilings, an abundance of windows and a large covered patio provide excellent vantage points for viewing the competition. Hardwood floors and chandeliers add hints of southern charm and sophistication. And, plush furnishing and a large indoor/outdoor stone fireplace provide comfort while sipping cocktails or enjoying a bite to eat from Sweetbay Restaurant. Multiple large, flat screen, high definition televisions are placed throughout the clubhouse for the viewing of news, sporting events and weather.